Work: Appointed surgeon to the New Hampshire Troops, 1745; Member of the Provincial Assembly, 1758-62, ? ?-1775; Colonel of the Londonderry Militia, Londonderry Town Selectman, 1763-75; Londonderry Committee of Safety, 1775, 76; Speaker of the New Hampshire House of Representatives, Associate Justice of the Superior Court, Delegate to the Continental Congress, 1776. 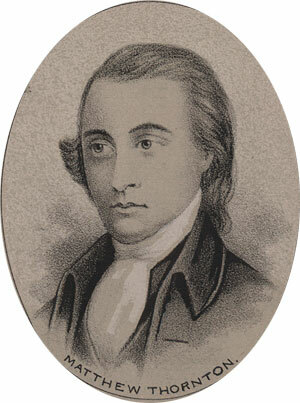 Matthew Thornton was born in Ireland in 1714. His parents emigrated to America when he was three. They first settled at Wiscasset, in Maine, but soon went to Worcester, Massachusetts, where Mathew received an academic education. He became a physician, and in 1745 was appointed surgeon to the New Hampshire troops in the expedition against Louisburg. He later held royal commissions as justice of the peace and colonel of militia. His medical practice was very successful and he acquired much land, becoming a leading member of the community in Londonderry. There he held many local offices while also representing Londonderry at the Provincial Assembly. Thornton eventually became President of that assembly. As a member of a local committee of Safety in 1775, he was asked to draft a plan of government for New Hampshire after dissolution of the royal government. His plan was adopted immediately and became the first constitution for that state (and was in fact the first new state constitution after the start of hostilities with Britain). Thornton was then selected as the first President of the New Hampshire House of Representatives, and as a justice to the Superior Court, under the new constitution. He was also sent to the Continental Congress-too late to participate in the debates over Independence, but just in time to sign the Declaration on behalf of New Hampshire. He was selected to attend Congress again in 1777, but declined to attend due to poor health. For the rest of his life, Thornton attended to State duties. He also wrote political essays for the newspapers. He died at the age of 89, while on a visit to his daughter in Newburyport, Massachusetts, in 1803.